In the city, you can see pharmacies like this in market places. 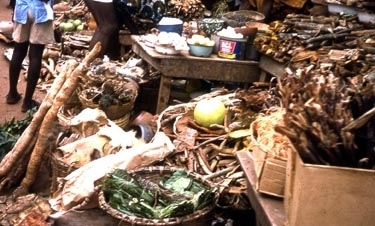 You can buy roots, leaves, bark, minerals, insects, dried lizards, powdered bones, animal organs, and other things to use for medicine. In remote areas such as Aboam, herbalists like Nana Adwoa simply know what to get, and gather their supplies from the rain forest. 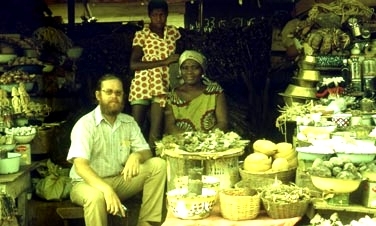 In the early sixties, the research and teaching hospital in The Hague conducted an extensive survey of the herbs used by Ghanaian herbalists. The breakdown of their findings was this: About 20 % had no medical indications but as placebos they helped convince the patients that they were being treated and would get better. That confidence assisted in recovery. About 40 % were hallucinogenic, and they convinced the patients that the gods were indeed entering their bodies to fight the evil and poison that was harming them. These, too increased recovery chances because of increased confidence. About 40 % were genuinely (in the Western science sense) indicative of medical results. Some of the medically indicative herbs have been incorporated into western medicine, as were various herbal medicines from Europe and Asia. As with quinine in South America, there are trees in the West African rain forest which produce a medicine in their bark which help the body to fight malaria. Various moulds work like penicillin to reduce bacterial infections. An interesting medicine is the root of the tree favoured for making umbrellas used by chiefs. 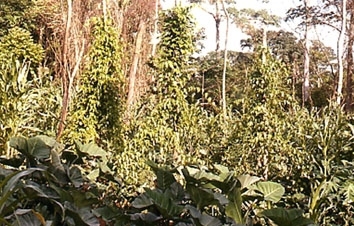 That root is made into (1) a strong medicine, with palm wine for a one off treatment, followed by (2) a lighter oral medicine using a distilled alcohol base (akpeteshi) for drinking daily, then (3) a poultice of the medicine to put onto the skin where it will pass through the skin to be concentrated in the desired area. When a person breaks a bone, it usually takes about six weeks, if the parts are held securely without moving, for bone callous to develop, temporarily knitting the parts of the bone together. After the bone callous is firm, the bones will do the work of repairing the bone itself, taking about two years. In contrast, using a splint and this root of the umbrella tree as a medicine, the herbalist can speed up that time needed to produce bone callous, from six weeks to less than two weeks. If you buy any commercial meat tenderizer, look at the list of ingredients in it. Apart from things that do not tenderize, like MSG, the one ingredient known to actually soften meat is papayin, the chemical inside papaya or pawpaw. The fruit is well known to use for many stomach and intestinal problems, reducing stomach ulcers and stopping indigestion. Many cooks know that when they use the skin of the fruit, wrap meat in it for several hours before cooking, the toughest meat will be soft when cooked. The chemical is most concentrated in the roots of the tree. If you take the juice from the root, and apply it vaginally, it will produce a stillborn abortion without harm to the mother. As part of the government teaching and research hospital in Akwapem, a doctor has set up a clinic where patients may come for herbal treatment, under the supervision of western trained medical doctors. The biggest problem and danger from using traditional medicines is strength and quantity. Often untrained persons will prescribe traditional medicines; the result is disaster, and the patient may be overdosed or wrongly diagnosed. Unfortunately, they, and not the successful cases, are the ones which end up in the western oriented and mission hospitals, and the attitude of western trained doctors is similar to the prejudices of the European missionaries. A bark will contain a certain amount of sap in the wet season, and so a particular amount needs to be prescribed. During the dry season, the same amount of bark or sap may be four to five times as concentrated, so the same amount should not be prescribed. 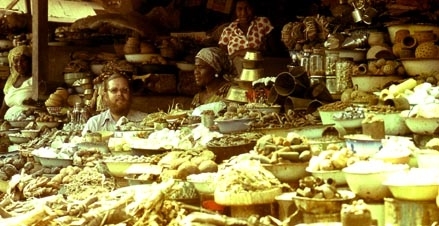 Well trained and experienced herbalists, including many akomfo, will know this and other caveats, but since the medicine is freely available in the herb market or forest, untrained and inexperienced practitioners make a bad name for the profession. This artefact from the pre iron age is an axe or hoe made of smooth or polished stone. This one is "in situ" in an archaeological dig by the University of Ghana. 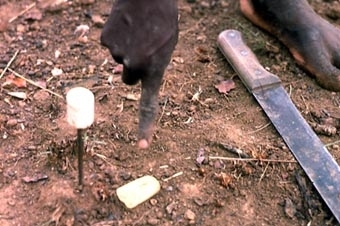 They are found all over Ghana, usually discovered when farmers clear land for planting. 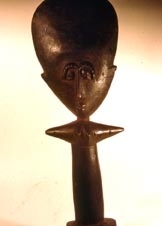 They were designed to be used as iron adzes (by male wood carvers) and hoes (by female farmers) are used today. Because of their association with the Ancients, and consistent with the notion of contagious magic (why ancestral bath stools are sacred), they are often ground up and the powder used for medicine. 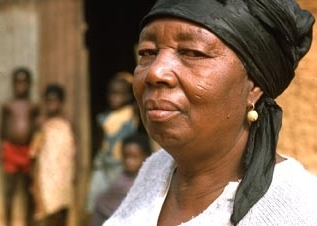 When you see an Akan person with a small scar on the cheek, you might be tempted to see the scar as an ethnic identification. 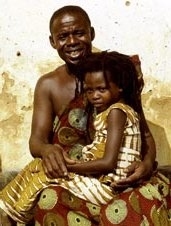 Larger scars are used by various peoples, such as the Talensi (Fra Fra) in Northern Ghana, or the Yoruba in Nigeria. 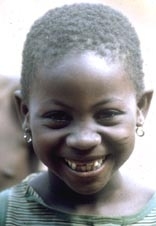 For the Akan, in contrast, the scar is from a vaccination, not used for ethnic identity. Herbalists make a black powder called botכ. It is composed of various traditional medicines ground into a powder, and mixed with charcoal powder. There are various fevers, such as from malaria or dengue, which particularly affect children. When a western doctor gives aspirin and codeine, this is symptomatic treatment, for reducing fever. Fever reduction, however, does assist the body to fight the disease. The botכ powder works much like those western antipyretics, reducing the fever. A small incision is made in the cheek of the patient, and the botכ is put into it. Taking the botכ orally is not as effective because the chemicals are broken down by digestion. Botכis also the black powder used for making ancestral stools from chiefs' bath stools. When a women has difficulty becoming pregnant, she will go to an כkomfo (priest or priestess). The god will make a journey to the land of the dead to convince a spirit there to come back to earth as a baby. 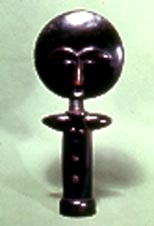 The women is given a doll like this, carved by men, which she wears on her back where babies and infants spend much time. 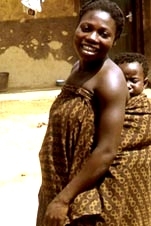 She wears the akuaba under her dress, however, because she does not want advertise the possibility that she is infertile. 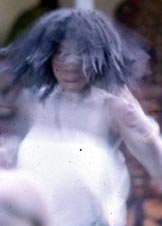 At the invitation of the God, the ancestral spirit will then come and inhabit the fertility doll for a while, making an assessment of how good a mother the women might be. Does she have a nurturing and pleasant personality? Does she cook well? Does she keep the compound clean? 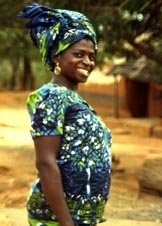 If the spirit is satisfied, it will then inhabit her womb and she will be pregnant. While I spent time in Nana Adwoa's compound, remote as it was, I met many people whom I knew from more urban parts of Kwawu. 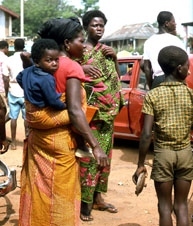 Although many women are devout Christians, especially Catholics who have a strong presence in Kwawu, they are syncretists, and come to a God like Nansing when they need assistance with fertility. The nuns at the Catholic clinic cannot make them pregnant. Among the herbs known by herbalists and many akomfo, there are moulds inside the bark of some trees which can cure some STDs such as gonorrhoea. An after effect of the disease often is dilated and clogged fallopian tubes which hinder the ovum from entering the womb. Adwoa has a combination of medicines which (taken vaginally) can open those tubes and allow a women to become fertile again. The medical chemistry is not inconsistent with the theology of fertility. African hair is very fragile. It breaks easily. If you look at a cross section of a hair, it will be flat or oval, in contrast to round hair that you find on an East Asian. The more round the cross section, then the straighter the hair. Flat cross sectioned hair is very curly, but it is fragile. Adwoa wears mpesempese hair, which looks matted from a distance, and can be confused with dreadlocks. She puts a raw egg in it every one or two days, which she jokes as being a sacrifice to the God but also protein which strengthens her hair and helps it to not break off. She shampoos it once or twice a week. Her hair is soft, fluffy, and sweet smelling. Many priests and priestesses with whom I spoke have indicated that they do not like African American dreadlocks, because the people who wear it do so for style, and do not know the religious significance of it. 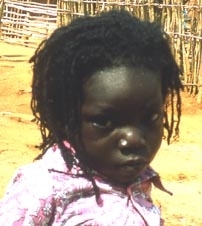 The akomfo have much more respect for Rastafarians, whose hair, they say, is worn as a sign of respect to God. 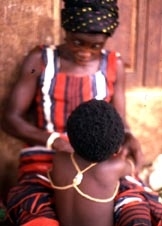 When a woman is barren, and goes to an כkomfo for assistance, and a child is born, the child will wear mpesempese hair as a sign of thanks to the god. It does not mean that the child is possessed by the god, or that s/he will grow up to become an כkomfo. 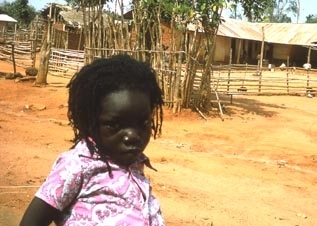 Since most of the schools are run by Christians, and the Christian teachers verbally and physically abuse children wearing mpesempese, (which no professional teacher could do in Canada and keep her or his job), the hair will be shaved off and given to the כkomfo when the child is ready to attend school. Since the date of birth on the Christian calendar is not recorded; only the day of week or soul day is remembered, it is difficult to calculate if a child is old enough to go to school. The child is asked to put her or his right hand up over the top of his or her head and to touch his or her left ear. If the child cannot reach the ear, s/he is still too young. If s/he can reach the ear, it is time to start school. While most gods assist in fertility, Nansing has another speciality that is a bit more rare. The god can assist an alcoholic person to give up the booze. As well as following certain restrictions in honour of the god, the client must also take a medicine that Adwoa makes, after collecting some herbs before dawn in the morning. When the client takes that medicine, s/he will get violently sick, with nausea and vomiting, by then drinking any alcohol. Nana Adwoa makes her living as a farmer. She can not charge fees for any of her medical, spiritual or moral help. Like other akomfo, she relies on her popularity, having many successful clients, to be able to attend public festivals and ceremonies. Many of them bring token gifts of fruit or eggs for the god when they visit her village. Others may bring a sheep to express thanks if she has done something that they greatly appreciate. Her assistance, however, is always available for free.